Bas Lansdorp, founder of Mars One, confirmed the bankruptcy of the venture's for-profit arm, Mars One Ventures AG, but said he was working with administrators and a potential investor on a way to rescue it. WASHINGTON — The company that was to finance Mars One has been liquidated, dealing a severe setback to the venture's quixotic goals of one-way human missions to Mars. "We're working with the administrator and an investor to find a solution," he said in a Feb. 11 email, but said he couldn't publicly discuss the status of those efforts at this time. Plans for precursor robotic missions also suffered delays. Mars One awarded study contracts in 2013 to Surrey Satellite Technology Ltd. (SSTL) to develop an orbiter to serve as a communications relay, and to Lockheed Martin for a Mars lander based on the design for NASA's Phoenix mission. However, activity on those projects ground to a halt by early 2015 after the companies completed their initial studies and did not receive funding for additional work. 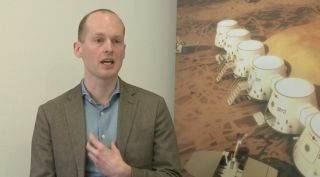 Asked Feb. 11 if he could provide any news about the astronaut selection process or other Mars One Foundation activities, Lansdorp responded, "No news from the foundation at the moment."